“The SCOURGE Of SCAPA FLOW” By J. Farragut Jones. (Fiction) Third book in this series “The Silent Service.” Unterseeboot 47–– Newest, deadliest U-boat in Admiral Doenitz’s German fleet, captained by Gunther Prien, ace-of-aces, with his aide, the enigmatic Nielson, whose bizarre heritage links him to both sides in this critical phase of World War II. The prey in this new patrol is the HMS Royal Oak––mighty pride of the British fleet, anchored with her sister ship in the “impregnable” fortress-harbor of Scapa Flow. The stage is set for the most spectacular undersea raid of World War II. 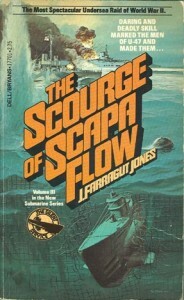 1981 Paperback. 352 pages, no photos, maps or index. Never published in a hardback book.